It seems like I have come in here and started many a blog post with a confession. I can’t help it. I am given a virtual microphone and I can’t help but say, “Yes, I did this!” because I feel like at least one or two or seventeen of you will look back at me and say, “You, too? I thought I was the only one who thought that?” so congratulations, dear poets, we are not alone. Being together is a big part of what OctPoWriMo is, after all. I offer you a place to practice pedaling around in the poetry stream in the days before we officially begin with my next confession. When I was a new poet – well, not new exactly but new in taking my poetry writing and love of poetry more seriously – I did not read much poetry by other poets. I didn’t own a single poetry collection. I just didn’t think I could get through them. I still can’t say there was a defining moment when I said, “I think I’ll start reading published poets,” or specifically modern poets or poets that have won Pulitzers or something like that, but I do know the first collection of poems I ever bought was one of Mary Oliver’s on a bargain table at Russo’s Books here in Bakersfield. I started to discover slowly and steadily the joy of reading poems by other poets aloud. When I was perfecting my English accent for a play I was in I bought a collection of Elizabeth Barrett Browning and was nearly in ecstasy listening to myself reading her words. Reading aloud gave each poem a whole new life, whether I particularly enjoyed the poem at first read or not. I scoured the internet looking for poems for you to read aloud. I specifically hunted for poems written during or after the twentieth century in honor of my friend, Morgan, who doesn’t fancy older poetry as much. such poetry. 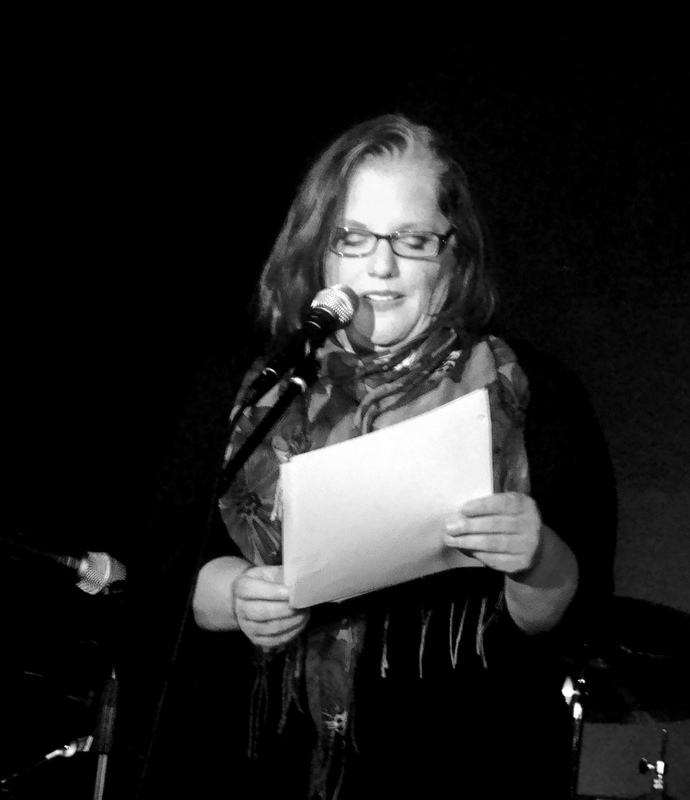 This page will bring you to a page of poems that have been chosen specifically because of how delightful they are to read aloud. 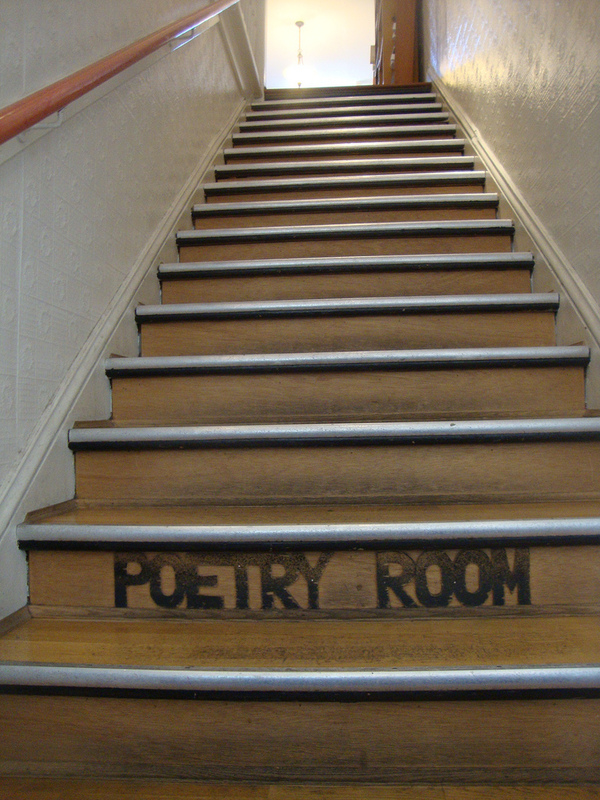 Scroll down to Number 7 (and the rest) to find the modern flowing poets. Number 7 is a blast to read aloud. I adore Ferlinghetti and all his Beat friends. A side note, if you are ever in San Francisco you must go to the Poetry Room at the City Lights Bookstore where many of these wonderful folks used to hang out, plus at the bar next door. A special bonus is Jack Kerouac alley right behind the bar. I digress. The content of these poems are very different from one another, so even that will help you discover something of the craft of poetry by reading them ALOUD. I so strongly recommend reading them with your voice, at your pace, with your rhythm. Other poets to look for: Mary Oliver, Billy Collins, Anne Sexton, Sylvia Plath, Maya Angelou - please add your suggestions in the comments. I have a strong tendency toward women so gentlemen (and other ladies) help our OctoPoMo poets a bit here. A special bonus: visit a used book store, thrift store, library sale, and buy a collection of poetry. Any poetry book will work. 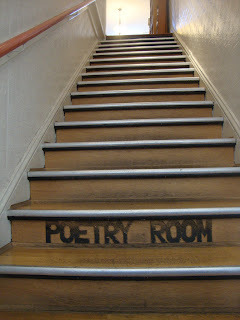 Begin reading one poem aloud daily if you can. Even one aloud a week would be good. And then stick to it. Listen to your voice as you read that poet’s work. Notice when you sit (or stand) to write next time, if there is any new influence from that poet you read aloud. If there isn’t, surely there is no loss in trying. Let the poetry seep into your bones. You could read Ferlinghetti’s poem via the link here every day for a month aloud and I bet you would find something new in it. Another suggestion: if you are unfamiliar with which poet’s collections to buy, I would suggest a compilation of different poets. If you go to your bookstore and ask at the customer counter, there will be someone there who knows which collection is popular. I especially love Roger Housden's "Ten Poem" series which have titles such as Ten Poems to Change Your Life or Ten Poems to Say Goodbye. I also have a request for those of you who read poetry books regularly to leave some book recommendations for others to check out both now and in the future. Shel Silverstein is one poet I read a lot of. Thanks for sharing this, I enjoy it! Adrienne Rich - Thanks to you! And the newest poetry book I'm reading - Alight: Best Loved Poems From The 2013 Women of the World Poetry Slam - As selected by the Audiences. I love reading these poems aloud! And ever since I bought my first Adrienne Rich poetry book this summer I have been reading them out loud, if not daily, almost daily. Oh, I love the idea of the slam poetry stuff. I need to find that book!! I have been rereading Seamus Heaney alot since his death 2 weeks ago. Many of his poems read aloud well. My favorite poet to read aloud is Kipling, such strong rhythms, really reads aloud well. I also like to reacie Burns and Yeats. A lot of Edith Sitwells poetry was written to be performed and features wordplay that words better when read aloud. I remember hearing Maya Angelou say that it was being told by her school librarian that poetry must be read aloud that got her speaking again after years of being silent. Try some of Lucille Clifton's poems aloud. And, read Cyrus Cassells's "Soul Make A Path Through Shouting." Is Cyrus a relative of yours, Annis? I love Lucille Clifton's words. I think Audre Lorde's may be stunning aloud, though I have yet to try them in that way. I also wanted to mention the first Poet Laureate of California was a woman named Ina Coolbrith. She was also the first Librarian in Oakland and had a strong influence on Jack London when he was young. She complimented his book choices so he would return often to chat literature with her. He didn't know until later how well respected she was as a poet. She also has a park named after her in San Francisco, one of my favorite places on the planet within one of my favorite places on the planet! Hmmm....this post has me thinking. I don't think I have read a serious poem since "Casey At the Bat" (I am a sports nut - Morgan has heard my story before!) and now I just may have to go shopping.